"One never forgets Mayberry, you know. It's such a charming little town." 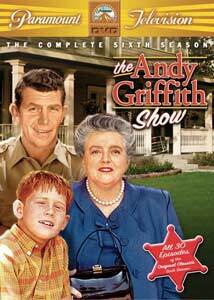 The sixth season of The Andy Griffith Show marks a few major changes, the most obvious being the move to color. The second biggest change was the departure of Don Knotts in his signature role as Deputy Barney Fife. Both Knotts and Griffith had originally only signed on for five seasons, and believing the series would run its course in that time, Knotts had signed on to a movie deal with Universal, leading to The Ghost and Mr. Chicken and The Reluctant Astronaut. Behind the scenes, producer Aaron Ruben left the show to work on the spin off, Gomer Pyle, U.S.M.C., and a number of writers responsible for the feel of the show for the past five seasons also moved on. With Barney off to the big city, Andy gets a new deputy in Warren Ferguson (standup comic Jack Burns), a police school graduate who also happens to be Floyd's nephew. Like Barney, Warren gets off to a rough start with his enthusiasm for curbing lawlessness, but when he arrests the entire Women's Auxiliary on gambling charges for their bazaar's bingo tables, things get out of hand. Warren also gets himself in trouble while trying to protect Andy from impending danger, and discovers his attempts to reform Otis into an artist aren't solving the problem he was trying to correct. Warren also manages to botch an assignment guarding a museum on founder's day, and his normally shy disposition around women is overcome while sleepwalking�at first with Helen and then with Aunt Bee. Filling the shoes of an iconic character such as Barney Fife is no easy job, and while Burns does his best in role the part just doesn't click; he would make an unheralded exit later in the season. Barney does make a return to town for the Mayberry High School reunion (earning Knotts his third Emmy for the role), and apart from showing off his turquoise and white Edsel convertible and bragging about his new responsibilities in the fingerprint department in Raleigh, his real hope is seeing Thelma Lou again, a meeting that doesn't quite work out as planned. Barney is reluctant to meet Andy's new partner until he finds out that Warren worships the ground he walks on, but Barney's ego boost is quickly doused when he gets word of an escaped con out for his head, prompting plans for a hasty retreat. This season also sees the Taylors off to Hollywood in a three parter after a director decides to make a film about Andy, but Aunt Bee isn't very impressed with some of the artistic liberties being taken�until she discovers how her own character is being handled. And when Andy's hobnobbing with a young starlet makes the front page of the Mayberry news, Helen's nose gets bent out of shape. Malcolm Merryweather returns to Mayberry, but his presence isn't appreciated by Ernest T. Bass when Malcolm takes over his job as crossing guard. Goober (George Lindsey) becomes central to several stories, as Alberta Nelson makes her debut as Flora Malherbe (after a brief appearance as Barney's secret admirer, Nettie Albright in The Return of Barnie Fifie), soon becoming the apple of Goober's eye. However Flora has designs on Andy instead. With the pairings settled, Andy uses his skill at manipulation to put right a touchy situation when Flora volunteers to take over while Goober is on vacation, becoming the star attraction at the filling pumps. Andy's sweetheart, Helen Crump (Aneta Corsaut), also appears in several episodes including one where she tries to play matchmaker for the town clerk (Howard Sprague). Aunt Bee keeps busy this season. She learns to drive, gets herself a job (but doesn't realize that the printers she is working for are up to no good), and turns a babysitting job into a disaster. Her enthusiasm over her winnings on a game show leave her friends a bit put off. Bee and Clara won't take no for an answer when they get the notion that a song they wrote will be the next big thing for a popular television singer. Opie learns to dance, but his essay on a historic battle leaves Andy wishing his son hadn't done his research quite so well, and when Opie and his friend pull a fast one on Goober, Andy is there to turn the tables on their amusement. The show still moves at a fairly relaxed pace, and still takes time for a musical number here and there. The simple charm of life in Mayberry still has its attraction, and despite some major changes, the show manages to keep things entertaining, if not up to the standard set in its previous years. Image Transfer Review: For its first year in color, the transfer here is extremely good. Colors are nicely saturated, the source is very clean, and the clarity fine. There is a little bit of ringing in places, but aside from that minor issue this looks far better than I would have expected. Audio Transfer Review: Mono audio does its job, with no obvious technical defects. Dialogue is easy to understand. No problems to report in this department. Extras Review: Extras are limited to trailers for The Brady Bunch, Charmed and MacGuyver, which are an optional feature on Disc 1. The set is again housed in Thinpaks with appropriately themed artwork. Episode synopses can be found under each of the five discs in the set. Five chapter breaks are included per episode, and there is a "play all" feature. In its sixth season, The Andy Griffith Show still manages to entertain in its down home and casual style. While it still has its moments, without Don Knotts it is just not the same show; however it continues to warrant a recommendation based on the solid performances from the remaining cast.